Today for my blog post I figured I would do a traditional blog post (for this blog, anyway) along with a "Part 2" that talks a bit about what a Herbarium is and what use it has to science. I've been talking a bit in recent blogs about my personal herbarium that I'm making with my Garden List species, and I've also done a few for the Herbarium at Western of species I've found on campus that only recently appeared. I'm a creature of habit and tend to walk the same path to go to the same place; because I happen to pay attention to the "green stuff" covering the ground, I usually notice when something weird pops up that wasn't there before. I'll talk a bit about one of my favourite weedy plants, which also happens to be my very first plant collection in the herbarium! Sandra, who I featured in a sneaky picture in a previous blog post HERE, is the Herbarium Assistant and Acting Herbarium Curator until the position is filled and she found it hysterical how excited I was about collecting and pressing my very first Herbarium specimen. Since then...I'm hooked. Anyone want a plant collection pressed and dried? I'm your girl. 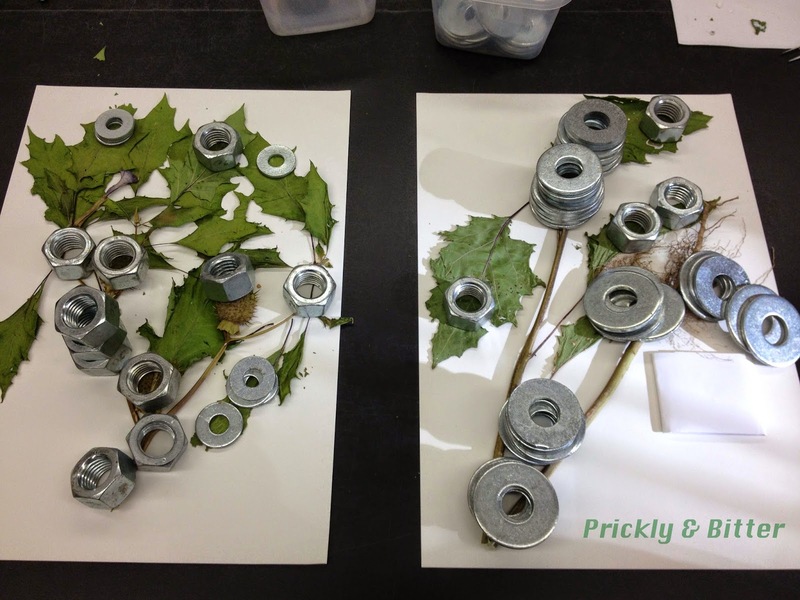 Even better (because it's more fun), want a pressed and dried collection glued and mounted on herbarium paper? Let me know. 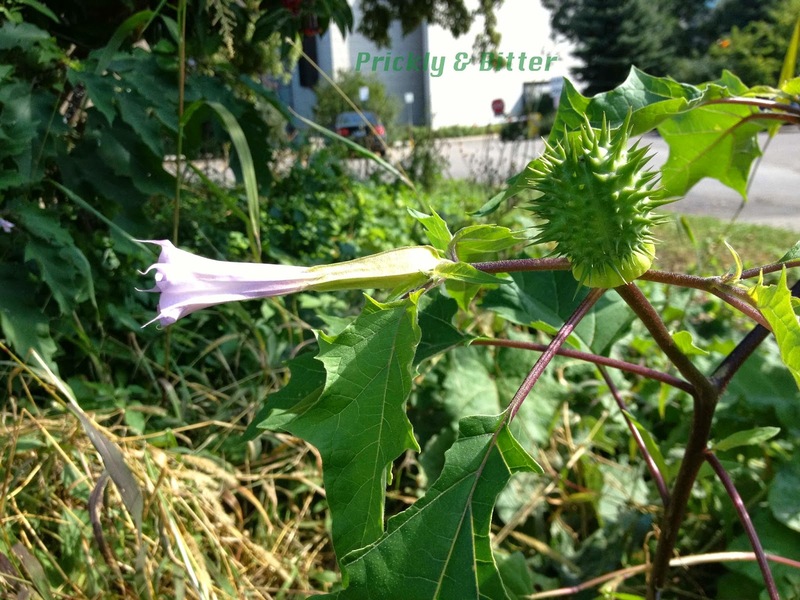 Jimsonweed (or Jimson weed...same plant, along with about 20 other common names this plant has) is my favourite weedy species that we have here in North America. 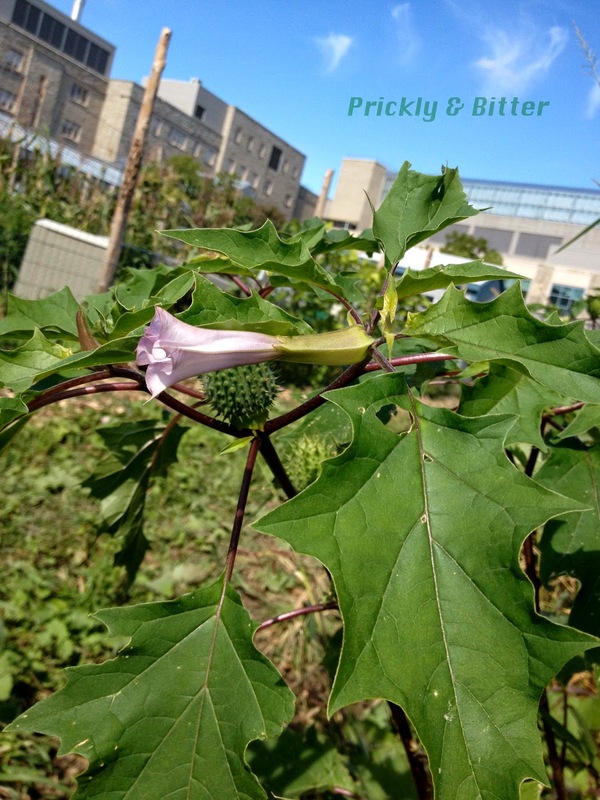 Not just because of it's many common names (HOW AWESOME is the name "devil's cucumber"?! ), but because of the rich history it has in the making of the identity of North America today. Without this plant, I doubt anyone living in the United States or Canada would have the same kind of "national identity" that we have today. This plant is widely believed to have originated in North America, but was spread across the globe very early for its recreational uses and so that's difficult to confirm. Since I really like this plant, I'll give it the benefit of the doubt and say it's native to North America...because I can :) It can be weedy and spread quite quickly, so if you do decide to plant it you'll want to make sure you dead-head the flowers before the seed pods form (or, if you like the appearance of the seed pods make sure you pick them off the plant before they crack open and disperse their seeds). Jimsonweed is in the nightshade family (Solanaceae), which is the same plant family that we find the edible food crops potatoes, tomatoes, peppers, and eggplants, as well as some ornamental species like henbane, mandrake, belladonna, and deadly nightshade (which, contrary to its common name is actually one of the plants that's least likely to kill you in this family, unless you're a small child or a beloved family pet). Like many of the species listed above, this plant is deadly poisonous. And when I say deadly, I mean deadly. Consuming the seeds from one seed pod would be enough to cause catastrophic organ failure in an adult human which would very quickly lead to death. Should you decide to only consume a few seeds, maybe 25 or so, it would also lead to catastrophic organ failure. This circumstance, however, results in a very slow, very painful death as your body slowly shuts down. Consuming only a small number of the seeds of this plant *may* result in a hallucinogenic trip, but it has equal likelihood in resulting in nausea, vomiting, diarrhea, dehydration, and you wishing that the world would end right then and there (but you'll live). 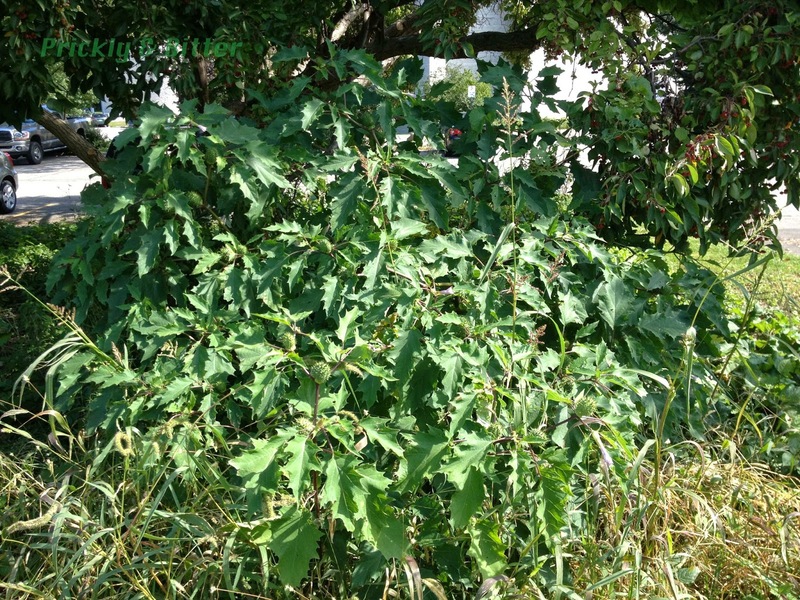 A few years ago there was a string of deaths of high school students in the United States, and it turns out that they all died from consuming Jimsonweed seeds. One of their friends had read on the internet that they're a free way of getting high, so they all ate them. Kids, don't believe everything you read on the internet! This plant is not worth it...trust me. Jimsonweed is fun to look at (how awesome are those seed pods?! ), the flowers have an absolutely wonderful aroma, and they provide some nice fall colour to a garden. But don't, under any circumstances, eat it. Ever! So why did I say above that this plant is probably the single most important plant species for the development of the identity of North America as it is today? Well...it comes from this plant's other major common name, the Jamestown weed. This name comes from Jamestown, Virginia, which was the site of Bacon's Rebellion. Long before Europeans sailed across the ocean blue to settle in what is now the United States, there were people already living there. In fact, there were a lot of people. About 14,000 people lived in and around Jamestown in the early 1600s when the first wave of settlers arrived. The local people were used to the types of harsh conditions to be expected in the winter months, but the Europeans were not so lucky. Many of them died, and it is widely speculated that the few that remained turned to cannibalism in order to survive. During the second wave of settlement, the "new Americans" were smarter: use the locals to build us shelters and show us how to gather food, and kill them if they refuse. There were many clashes between groups, resulting in hundreds of deaths. Nathanial Bacon decided he had had enough of the British fighting with the local people, and started an uprising. Governor William Berkeley had started teaming up with the local people to start building a nation. This angered some of the early settlers, since these same people were responsible for the deaths of many of their friends and family (it swings both ways, but I guess that wasn't the point). Bacon gathered people (estimates are between 300 and 500 people) to fight against Berkeley, eventually driving him out of Virginia and back to Britain. One of the major turning points in the rebellion was when British soldiers started flipping sides and fighting against their countrymen and their own Governor...all because they had been drugged. 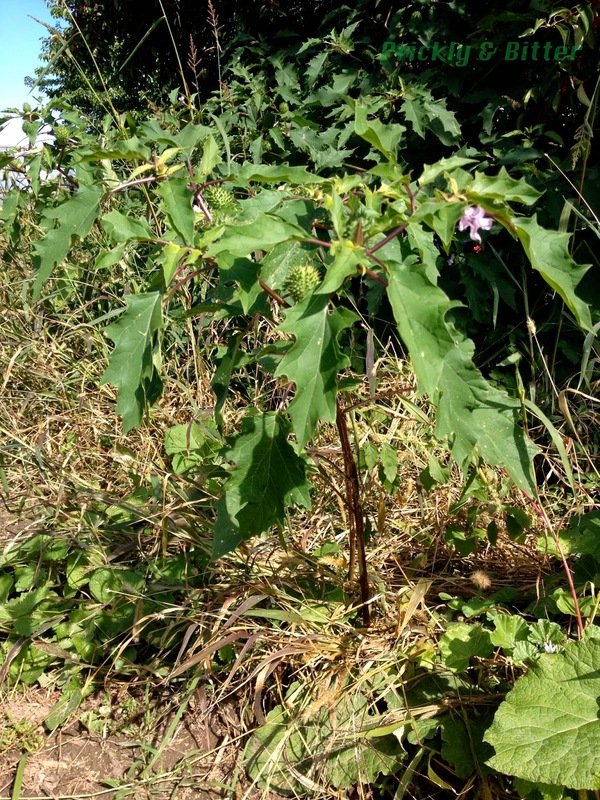 Bacon observed the local people preparing tea made out of a benign green plant (likely some kind of mint or other species which has a strong flavour, since Jimsonweed is reported to not taste very good) and sprinkled with 2 or 3 of the seeds of the Devil Plant. He prepared this same tea to offer to the freezing British soldiers, who promptly hallucinated for two weeks and became violently ill. While hallucinating, the soldiers were manipulated into amusing Bacon and his supporters, and once the drug's effects wore off they returned to normal, confused as to where the time had gone. When they were ostracized by their fellow soldiers for the actions performed while "under the influence," they decided to flip sides and help drive Governor Berkeley out of their new settlement. Berkeley retreated across the river, but with Bacon's death in 1676 a new leader of the Rebellion took over: John Ingram. Unfortunately, Ingram wasn't a very smart man. He decided to start a fight against the Pamunkey people, which were loyal supporters of Berkeley and even supplied him with warrior fighters. Between the British and the Pamunkey, the Rebellion was defeated and the rebels were driven out of the new settlement. The "good guys" had won. 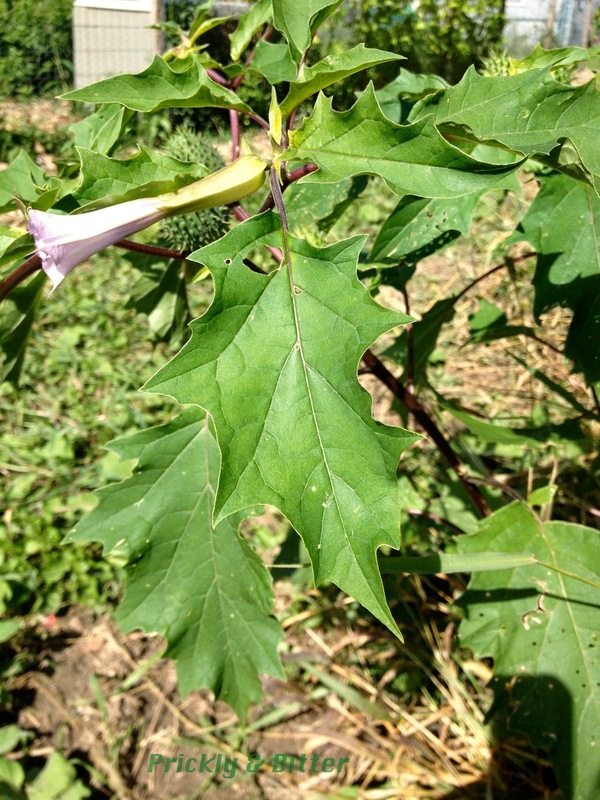 It has been speculated that if the British soldiers drugged with Jimsonweed hadn't flipped sides, Ingram never would have had enough supporters to wager a war against the Pamunkey people. Without this pivotal attack, Berkeley might have decided the war wasn't worth it and retreated back to Britain. What would this side of the world look like if this had of happened? It's impossible to speculate, but I bet it would be very different than what it is today. All thanks to a plant. Jamestown, Virginia actually has an incredibly fascinating history in the early settlement of North America, and the independence of the United States. If you'd like to read more about the waves of settlement, the clashes that occurred, and the REAL story of Pocahontas (yes, that happened in Jamestown, too!) you can read more on the Wikipedia page HERE. This plant isn't all bad. The active ingredients leading to hallucinations (and ultimately death) are alkaloids called atropine and scopolamine. Some of you might recognize these two compounds, as atropine is one of the most successful drug compounds used in treating severe asthma. In large amounts, atropine causes the paralysis of the lung tissue and the dilation of the bronchioles which increases air flow. In smaller amounts the paralysis occurs to a much smaller extent allowing the patient to still be able to breathe, but dilates the bronchioles to increase air flow. Scopolamine is also a very important drug in modern medicine; it's used to treat symptoms of Parkinson's disease and is one of the most effective anti-tremor medications (in small concentrations, of course!). 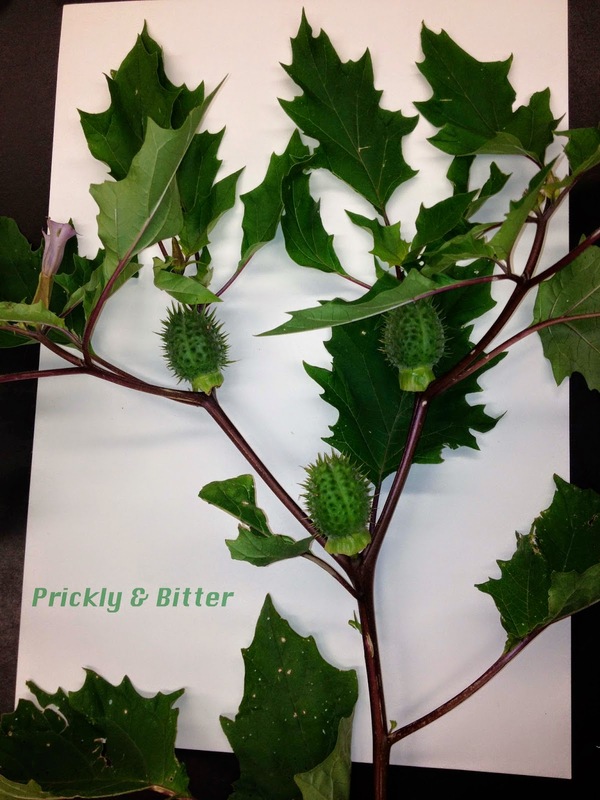 Datura itself (the combination of these two alkaloids) is used to treat morphine addiction. Because of the effects on the body that it has, there are certain conditions that it will aggravate like glaucoma or difficulty urinating. Glaucoma is caused by an increase in pressure of the fluid of the eye, which can be aggravated by atropine (which causes the dilation of blood vessels, which would increase blood flow to the eye and increase the pressure even more). One of the main effects of both atropine and scopolamine is the inhibition of the parasympathetic system, which is responsible for the regulation of urination. If you're already having trouble urinating, inhibiting this further could be disastrous. But, again, this plant WILL KILL YOU if you try to make some kind of medicinal concoction on your own. Prescribed drugs have these compounds in very small, controlled amounts. The plant does what it pleases. Don't be stupid. Now that you know why this plant is just so awesome, I figured I would talk a bit about this "Herbarium thing": what it is, what it's used for, why they're important, and what is stored in them. A herbarium is like a library, but for dried plant material. When you walk into a herbarium (which is climate-controlled to prevent insect infestation, so usually kept around 15 C) the first thing that you'll notice are rows upon rows of cabinets. The cabinets contain stacks of sheets of card stock, on which is glued (or sewn, if you've got a really old collection) a plant collection. This collection is identified by species name, a location of where the collection was made (which now includes coordinates), any important information to go along with the collection, who made the collection, and a collection number (often called an accession number). Herbarium specimens are very similar to books: they have titles, authors, years of publication, and a brief description (like liner notes) of what can be found on the page. These specimens are then preserved for all of eternity, and databased so they can be accessed by researchers from other institutions. Some herbaria have thousands of collections (the Western Herbarium has about 60,000 collections), while others like the New York Botanical Gardens or the Paris Natural History Museum have millions of collections (about 10 million at NYBG, 8-9 million in Paris). Herbarium collections are invaluable to science since they show a snapshot of the plants living in an area in any given period of time. 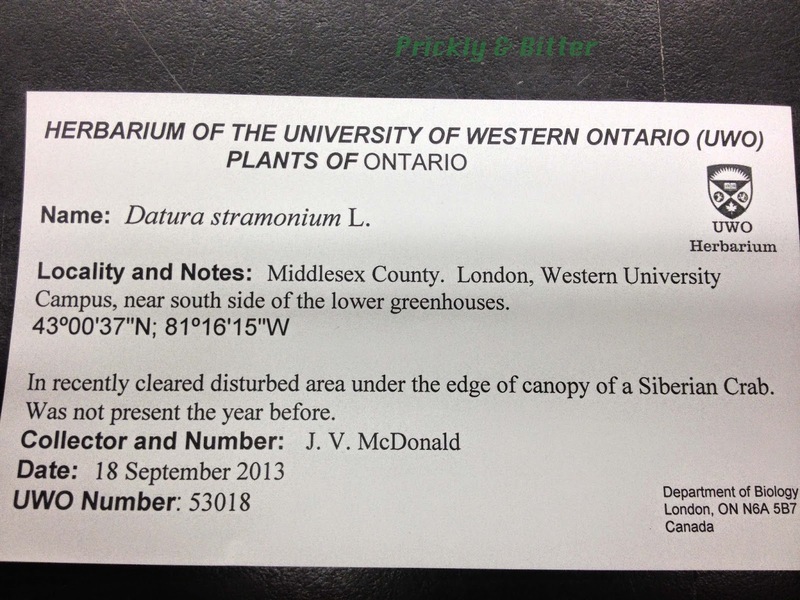 The herbarium collections at Western are "young" compared to other institutions since our oldest specimen is from the late 1800s. For my research, the oldest herbarium specimen I received on loan was from 1799, and many were from the 1820s and 1830s. There are some collections in Kew and in Paris from the 1500s! Herbarium specimens have been used in a wide variety of different types of biological studies, from studies about taxonomy (where you study old and new collections of species to look for new species "lost" in herbarium collections or to help you determine whether what you collected is a new species or not) to conservation biology. Herbarium specimens are actually becoming more and more crucial in conservation and restoration biology as habitats are becoming more and more degraded. What plant species used to be present in a given area, compared to what is there today? Can species that used to be present even be located in the same area now? Has the composition of which species are present completely changed? What does this mean? There have even been cases of determining that a plant species is now extinct in the wild based on herbarium collections. The species was collected from an area, described, and hasn't been seen since. Now, it should be obvious even to someone who's never made a herbarium collection before that this isn't going to work. Half the plant is missing; it's about 2 times bigger than the size of the paper. So what to do? Well...cut it. All of this preparation of a specimen needs to be done before it's dried, or else the dried plant will just shatter when you try to manipulate it later. I cut the bottom off right at the edge of the paper, and the bottom half became "sheet 2 of 2" for this collection. Next, the collection needs to go between pieces of newspaper and pressed out flat in a herbarium press, which then goes in the dryer to dry the specimen as much as possible (which can take up to a month, depending on how juicy the plant material is!). When a collection is pressed, maintaining the integrity of the plant is very important, because if someone wants to see your collection in 60 years they have to be able to determine what it even is. Showing the upper side and the lower side of leaves is important, but never the same leaf. Folding leaves when drying makes them very fragile and should be avoided when possible. The flowers of the plant, if present, should be kept as visible as possible and all other plant material should be pulled away. The seed pods, if present, should remain on the plant and should also be easily visible. Once all of the manipulation is done, put the newspaper-plant-sandwich into the press, the press into the drying oven, and forget about it for at least a week. Once the press comes out of the oven, the sheets of newspaper can carefully be removed and opened. Sometimes tweezers can help to carefully pick the newspaper off of the plant material, since sometimes plants "juice" when they're squeezed into a tight location like the herbarium press. As long as the collection is dry, it's ready to be mounted on herbarium paper. And now you can do any finishing touches! You can see that there are four of the big nuts weighing something down above the label on the sheet on the left. When the seed pods of Jimsonweed are dried, they split open to release the seeds. We want to keep these! 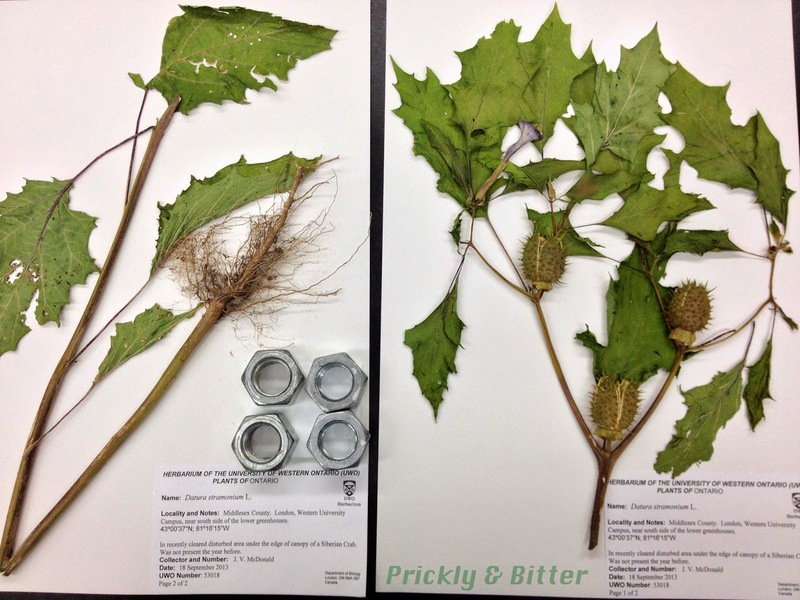 Any plant material that falls off of a pressed herbarium specimen is still important material. These go into a little paper envelope, which is glued directly above the label of the specimen (or on page 1 of 2, if there is more than 1 sheet that goes with a single collection).